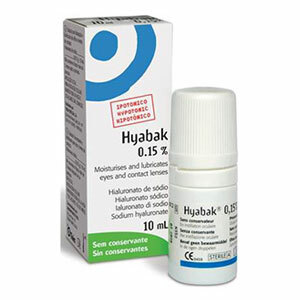 Hyabak preservative-free, isotonic 0.15% sodium hyaluronate drops for long lasting relief from uncomfortable and dry feeling eyes. Sodium hyaluronate holds the water in the tears because it of its water retaining and slow release property. These ‘smart technology ‘ eye drops therefore flow when you blink and keep a clear surface when your eye is still.